Hospital website redesigns aren’t easy. First of all, there’s the internal politics. They seem to put the needs of individuals and department agendas over the needs of the entire organization. This complication seems to affect hospital website redesigns more than any other industry. Second, and perhaps more difficult to address, is the simple fact that “Hospital employees are busy doing. Not documenting.” I got this insight from a trusted colleague and I never forgot it. One of the biggest struggles hospital marketers face is developing content that tells each clinical department and program’s unique story—and explains why their treatment is a patient’s best choice. And because hospital staff are busy saving lives this can make getting the information you’re looking for harder than with other organizations. After leading the website redesign initiatives at three of Boston’s most well-known academic medical centers, I’d like to share a few valuable insights for your next hospital website redesign. Websites. Mobile apps. Search marketing. Online ads. Content marketing. There’s no end to the digital marketing tactics you could choose. Your roadmap, however, should align with the digital media your target audiences use most. For example, it makes no sense to spend time putting together a social media strategy if your audiences don’t use the social media space (Hint: they do). 2. Put Down The Wireframes and Photoshop. Start With Your Brand. It’s Your Most Powerful Differentiator. Tell your hospital’s story. Lead with the heritage, the innovation, the culture and your people. These are unique. There are numerous books, articles and consultants that can help define and build consensus around your brand’s characteristics and value. These are three of my favorite resources The Hero and the Outlaw: Building Extraordinary Brands through the Power of Archetypes, The Brand Gap and White Rhino (shameless plug, I know). Make sure your new website supports your readers’ goals and your organization’s business objectives. The best way is to conduct small batches of primary research in the upfront portion of your project and use those insights to shape digital marketing strategies. I’ll write a future White Rhino blog article on developing your own primary research instrument and how to run your own study. And in case you need help from a consultant but don’t know where to start, I recommend our own Chief Uncomplicator, Anne Piessens or this great research firm Copernicus Market Research. Hospitals are organized by department. A patient, however, visits a hospital website post-diagnosis navigating for care by condition or disease. Your website content should be organized the same way. A hospital website can have over 3,000 pages of content. To help architect, write and get buy-in across the many different clinical, research and educational departments, organize the content by content types: Treatment programs, department overviews, physician profiles, fellowship programs, research programs, research labs, news articles, etc. 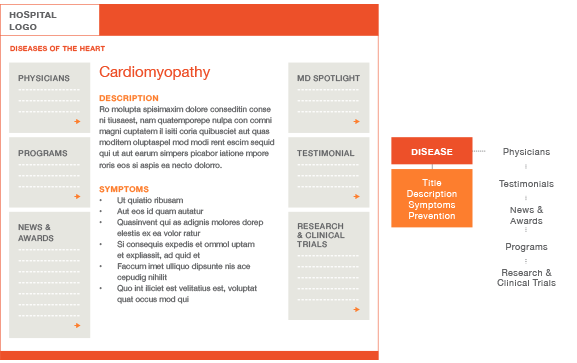 The earlier in the process you address your hospital website’s complex content, the better. Creating this structure will help your information architect begin the sitemap and wireframe process. It will help your stakeholders understand where their input is most required and, in the end, it will make faceted search and contextual content display possible across the website. Yes, your website should communicate your brand and your differentiators. Think of it also as a way to improve your patient’s experience. From simple web forms that send appointment requests and patient referrals to online tools that allow patients to chat securely with an expert, pay a bill, refill a prescription and access their medical records, a successful hospital website enables the reader to engage with their health provider and streamline the communications process. Check your traffic logs. Prospective patients want to know what you offer and who offers it. It may not be anything new for your organization, but a website redesign is an opportunity to rethink your MD profile pages and give them new life with revitalized content display opportunities, transactional capabilities and modern design interfaces. Here are two nice examples University of Utah Hospitals & Clinics and Tufts Medical Center. Most hospital websites grow to a 1000+ pages. And now that hospitals are tasked with constructing more complex digital experiences with limited staff size, keeping content current and up-to-date is an inevitable challenge. Take the time upfront to implement a strategy that addresses the issue. For example, consider building social-media feeds into your pages so Tweets, Instagram photos, Facebook comments and YouTube clips automatically energize content that can otherwise grow lifeless over time. Today’s CMS platforms are wonderful for supporting decentralized publishing governance models. However, one of the features that’s most often overlooked when selecting an enterprise-level CMS is its ability to share and relate content types to one another via tagging. For example, tagging eight content types in your CMS with “diabetes” gives hospital marketers the ability to build condition hub landing pages that a) patients can use to navigate to their treatment options and b) Google will index as content-rich and well-organized thematic pages. This diagram shows an example data structure. Creating, maintaining and successfully publishing web content is no easy task. We often talk about “web authors” sprinkled throughout the organization who are asked to play one part copywriter, one part web designer and another part web programmer. And the promise of a CMS that allows anyone to copy and paste text into a WYSIWYG window and build vibrant and engaging web pages isn’t always as simple as it sounds. That’s why developing a web governance model that supports this effort will be a critical component to your website’s success. My experiences have been that an organization will align with a model that best fits its culture. For example, a large, decentralized organization’s website governance is, well, decentralized. And while it’s conceptually wonderful to let a thousand flowers bloom, the risk is that content and design begin to get outdated, one department’s content begins to look better than another’s, and functionality, design elements and content consistency begins to break down across the website. In contrast, when the model is completely centralized, the responsibility to produce meaningful content falls to the central marketing, communications and/or public affairs team. Problem is, these groups are often limited in size. My recommendation is to envision what your new website will look like 3-5 years after you have launched knowing that your target audiences are not only grading your hospital website based on other hospital websites but also on the websites that they use most, for example, Google, Amazon, Facebook, Pinterest, news websites, etc. If this means building a hospital website that’s limited to 100 pages but enables you to provide up-to-date and relevant content created by a central bureau of web marketing content specialists it might be worth considering. Embrace internal politics and acknowledge that a few well-staffed committees can actually be your best friend. I have found it useful to develop committees to select an agency partner, committees for large departments like Medicine and Surgery (that have many divisions), senior leadership stakeholder committees and sub-committee working groups with subject matter experts including research, IS, Development and Human Resources. View my committee matrix below. This approach ensures that your initiative will run smoother; plus you’ll receive the trust and feedback you’re desperately in need of from departmental and divisional chiefs and chairs. If you have other insights I’d love to hear them. Email me at shawn@whiterhino.com or leave a comment below and I’ll add yours to the list and re-post as an eBook on the White Rhino blog. Shawn Gross is the Chief Digital Strategist, Healthcare Practice Lead for White Rhino in Lexington, Massachusetts where he helps world-class health care organizations build content rich, patient-centric websites. Shawn was previously the head of digital marketing at Tufts Medical Center, Floating Hospital for Children and Massachusetts General Hospital and can be reached at shawn@whiterhino.com.